September 25, 2015 – On the evening of September 27, 2015, the Moon enters the Earth’s shadow, creating a total lunar eclipse, the last of four visible in the Western Hemisphere in a span of 18 months. The bright full moon over North America should turn a shade of celestial red during the eclipse. For a total lunar eclipse to happen, the Moon must be full, which means it is directly opposite the Sun, with Earth in between. The eclipse happens when the Moon moves into the shadow cast by the Sun shining on Earth. We don’t have an eclipse every month because sometimes the Moon is above the shadow, sometimes below. 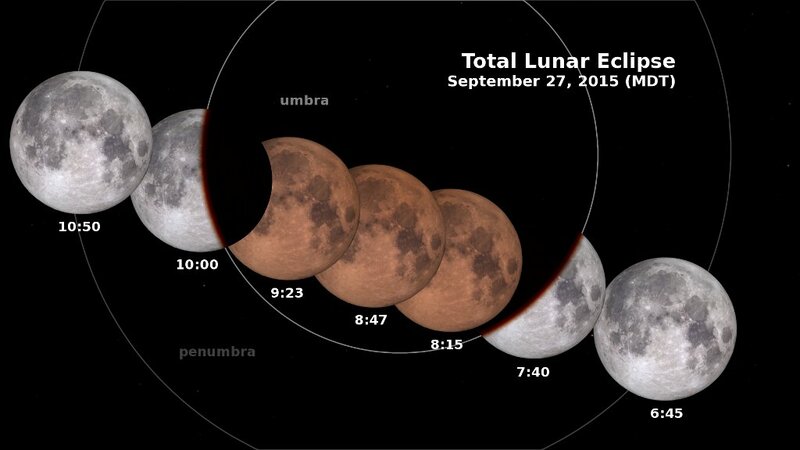 Description: Special lunar eclipse just after sunset; clouds permitting. Description: This is the last lunar eclipse of this tetrad cycle. The next tetrad cycle will not take place until 2032-2033…so you might want to take this one in. We’ll have telescopes on hand for up close viewing of the lunar surface as it turns a deep red color when passing through the penumbra of Earth’s shadow. And if you wish place your camera up to the eyepiece to get a picture of this incredible event. We start at 6pm. This is free to attend and of course everyone is welcome. If you have any questions please email Alan Knight at aknight@scaspueblo.com or call him at 719-337-3970. Description: As you know, there is a total eclipse of the Moon this Sunday evening. This is a very well-timed event, with the best part of the eclipse coming in mid-evening and easily visible (weather permitting) in the Denver/Aurora area. The CCA Observatory is planning to have a couple of telescopes set up for a close-up view, free and open to all. You are invited to join us. Description: Join Fiske for a casual evening of viewing a spectacular Lunar Eclipse. This eclipse is during prime time hours from 7pm-10pm. Just after sunset we invite anyone to visit the front lawn of Fiske and the observatory up the hill. We will have some telescopes to see a detailed look at the Earth’s shadow moving across the moon as well as CU astronomers to guide you through the science of what this eclipse is doing. This event is FREE. Be sure to bring a camping chair or a blanket to sit back and relax as this eclipse evolves over 3 hours. Description: The two observatories in Fort Collins that Front Range Community College operates will be open for the “supermoon” lunar eclipse. Both events are weather permitting, and neither observatory is heated, so please dress appropriately. For updates about weather conditions affecting the viewing schedule, check the observatory’s Facebook page. (https://www.facebook.com/sunlightpeak). Amateur astronomers are invited to bring their own telescopes.